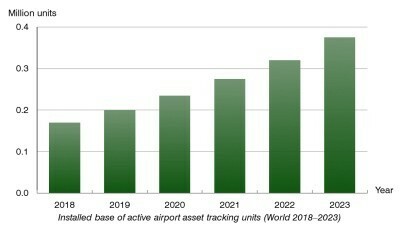 Berg Insight has found that that the global installed base of active airport asset tracking systems was less than 0.2 million units in 2018. 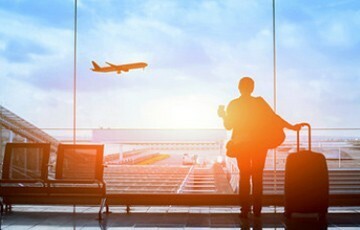 Berg Insight anticipates increasing uptake of airport asset tracking in the coming years driven by a number of trends related to technological advancements, collaboration and innovation among the solution providers and its prospective customers. Growing at a compound annual growth rate (CAGR) of 17.1 percent, the active installed base is estimated to reach close to 0.4 million units worldwide in 2023. “The airport asset tracking market is served by a number of different types of players, ranging from specialists focused exclusively on tracking and management solutions for specific airport assets, to companies that offer a more comprehensive set of solutions for the aviation sector, and more general telematics players that also serve other industries”, said Rickard Andersson, Principal Analyst, Berg Insight. Berg Insight ranks Undagrid (GSEtrack), Quantum Aviation Solutions and Resonate MP4 (XOPS) as the leading vendors of airport asset tracking solutions in terms of installed base. Additional major players include ADVEEZ, Targa Telematics and Pinnacle (iMATS). The latter has notably partnered with Honeywell which in late 2018 signed a major agreement with Swissport to deploy ground handling services jointly developed with Pinnacle. Targa Telematics has furthermore established a partnership with TCR Group which is also collaborating with Sensolus for non-motorised GSE tracking. “Additional players active in the airport asset tracking market for example include Litum IoT, DigiMobi, EC2E, INFORM, Inseego, Tri-Logical Technologies, Smarter Asset Management, Katlyn International, Speedshield Technologies and Geotab, all having installed bases of at least 1,000 units each”, concluded Mr. Andersson.